← Who is responsible for the parts we use? Conversion Manuals -building a plane and trying to save the wrong $75. If you were one of the people who thought the tone of my last story was a little harsh, let me share a little insight: I have been getting about one ‘special person’ a day lately, and the letter here Who is responsible for the parts we use? is just a sample of the kind of special stuff arriving lately. Try this: A person in El Paso who sent in the distributor with the cut wire in this story: Ignition “issues” and I-U-S-F , who claimed it was defective although it ran fine, when directly questioned about some information he was missing, said that he made the choice that he wasn’t going to buy a conversion manual from me. His plan was to only buy the parts, and save the $75. His reason was that he was just going to read stuff on line and on my website. Although he is building a Pietenpol he had never heard of my Corvair – Pietenpol Reference page, Guest Writer: Pietenpol builder/flyer Kevin Purtee nor the Colleges he and Shelly put on in the same state, nor our Piet Vair discussion group update, notes on joining. So much for getting all the information needed. Above is a sample instruction sheet that comes with all of our parts, including all the ones the person in El Paso purchased. The lines in yellow plainly state that you can not use the parts without a manual and have it be airworthy. Ask yourself, who reads this on all the sheets, and still thinks it is a good idea not to buy a Manual? Perhaps the man objected to my lavish $10/hr life style, and felt that it justified any action he might take to save $75. Your guess is as good as mine, as I have no understanding of that approach to aviation and expecting success. 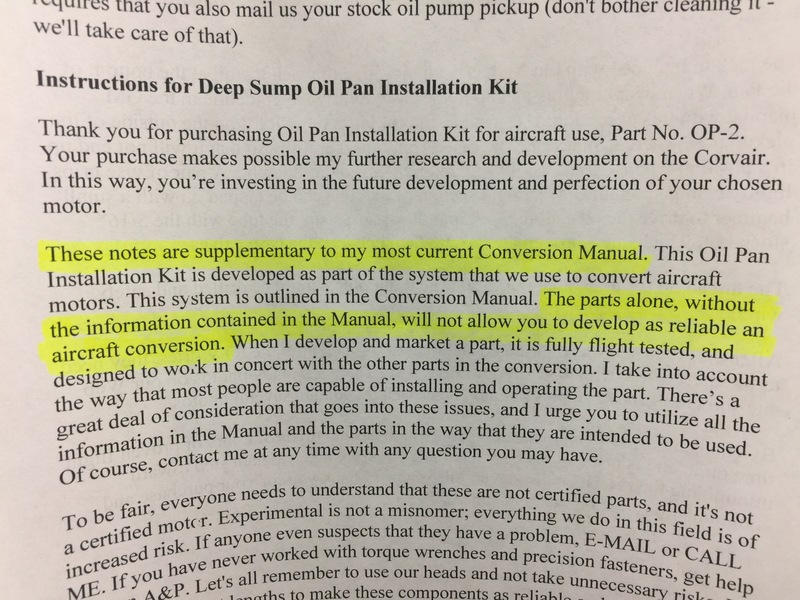 5 Responses to Conversion Manuals -building a plane and trying to save the wrong $75. William I had an older manual and do read all of the online information. Yet I still felt the new manual was worth the money. You can see the difference between the two and understand the lessons learned. I really don’t get why someone would not want to know as much as possible about a critical part of their aircraft. The first thing I did was but the manual and take a highlighter to passages that I thought brought out specifically important bits of information, things to buy, things to do or not do. Without that manual on the workbench you are working in the blind with a bunch of parts that only make up part of the conversion process. While we have met briefly several years ago in Barnwell and I have followed you for five years or so, I have enjoyed your writings on life and more importantly, on your father’s life and the obvious impact that he had on you. I am writing to you to express my condolences on your father’s passing. I lost my dad in 2000 at the age of 79 and still want to talk with him every day. He was that beacon in my life that so many men of that “Greatest Generation” were to their families, friends, and communities. I admired your fathers’ achievements from a distance, and could read your pride in him throughout your writings. People are often measured by others with the dollar yardstick, not the content of their character. Your father surpassed most if not all in his character, and his influence on you is reflected in those postings of your life’s philosophy. So continue to be proud of who you are and where you come from. If you were any different, I would have moved on from your writings long ago. Remember, you have a much greater impact on good in the world than you give yourself credit for. That is important, and that is a reflection of your father’s values imprinted on you and your family. Lastly, keep up your good work. Don’t be distracted with the naysayers and name callers. As Mr. Shakespeare once said (and I paraphrase)…”They are full of sound and fury…signifying nothing!” Keep following your Dad’s compass. I am an A & P with Inspector authorization and 45 years of experience but I have never built a corvair engine. In my professional life I never did any work or inspection without the manual or inspection criteria on the bench to reference. No one can remember it all and we all can make a mistake. I bought your overhaul manual, your DVD’s, I attended a corvair college and hope to attend more. I have been reading and studying your web pages which are so full of information on the corvair and on life’s lessons. I would never consider taking an engine down to bare parts and trying to build it back to airworthy without every bit of data I could find to make sure it was right. Frankly that’s the fun and challenge of it! I have a business associate who says: ” I know what I know, I know what I don’t know, I know who knows what I don’t know and that’s all I need to know.” Could that be WW? Stay humble and be willing to learn from anyone with real experience. There are things I used to know but have forgotten. But, I know where the manual is so I can learn them again.